The RIVA 36 recessed LED lighting system model RV-36 offers endless color possibilities to modify your surrounding. This system does not produce infrared and ultra violet light. Therefore, heat production is minimized, avoiding discoloration of objects being lit. This special feature gives the RIVA 36 LED lighting systems the flexibility for numerous types of applications such as architectural/retail spaces, stage/entertainment, video/film productions, night clubs, art galleries, museums and much more. The uniqueness of this system is ability to be recessed on ceilings and walls. 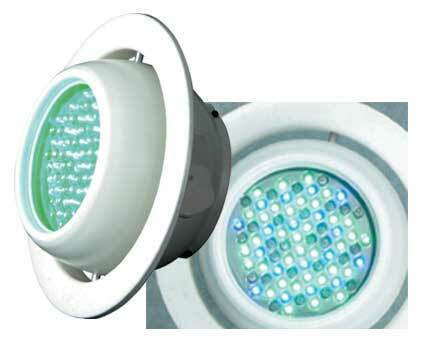 This solid-state lighting system has been designed for easy installation and safe energy efficient, long life operation. The combination of Red, Green and Blue LEDs offers a tremendous range of colors with smooth transitions from one color to the next. It comes with 15 degrees beam angle which in 1 meter distance produces 800 lux. • Dimensions:210x210x130 mm/ Ø8.5"x8.5"x 4.5"
Must be used with Pixel Drive Controller!